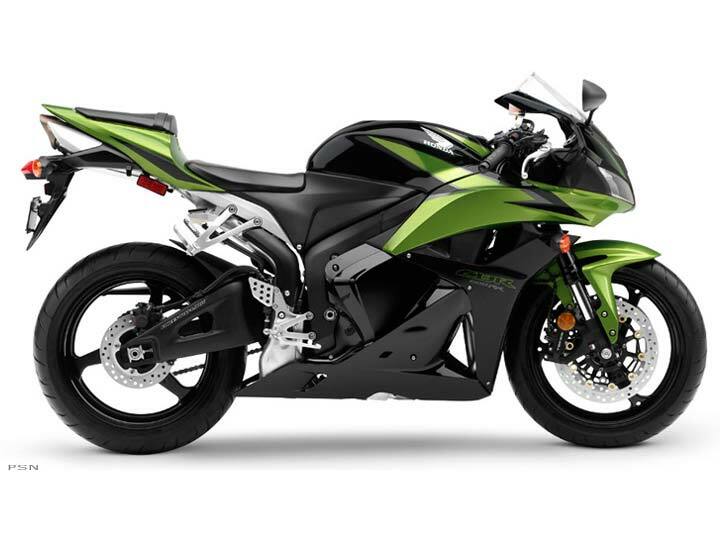 Like the bigger CBR®1000RR, the CBR®600RR is proof of how good a sportbike can truly be. On the track or street, there’s simply no better 600-class bike, as back-to-back AMA FX titles and "Best Middleweight Supersport" crowns from industry experts attest. Weight, performance, horsepower, handling — this MotoGP-bred machine is packed with the features that set Hondas apart. Compact rear-cowl storage compartment for U-type locking devices under the passenger seat (lock not included). Line-beam headlights feature three-piece multi - reflector design utilizing two H7 bulbs for optimum light distribution and a unique compact design. Integrated ignition-switch / fork lock for added security. One-piece fan assembly for maximum cooling efficiency. Attractive, hollow-spoke aluminum-alloy wheels feature race-spec 3.5 x 17.0-inch front and 5.5 x 17.0-inch rear dimensions. Industry-leading ergonomic design features maximum rider comfort for minimum fatigue in all riding conditions. Plastic tank shell cover protects tank and airbox. Instrumentation is very compact and features LCD panel with tachometer, odometer, twin tripmeters, speedometer, fuel gauge and clock. Centrally mounted 4.8-gallon fuel tank is positioned low in the frame, increasing mass centralization and allowing a more compact design. Exclusive, MotoGP-derived Unit Pro-Link Rear Suspension. Vertical-piston master-cylinder system produces superior leverage ratio at the front brake lever for higher braking efficiency, excellent feel, and controllability. This layout permits the use of a longer brake lever, which means more braking force with less effort from the rider. Radial-mounted monoblock four-piston front calipers feature chromium-plated aluminum pistons and squeeze lightweight 310 mm floating discs in front and a 220 mm rear disc with a single-piston caliper for exceptional stopping power. Hollow Fine Die-Cast (DC) frame uses four large castings for ultra light weight. 41 mm inverted HMAS cartridge front fork features spring preload, rebound and compression damping adjustability for precise suspension tuning. Cylinder head features two springs per intake valve and one spring per exhaust valve for optimum high-rpm valve operation and durability. Non-resonance knock sensor maintains optimum spark advance while constantly monitoring combustion performance during mid- to high-rpm operation. Lightweight stainless-steel four-into-one exhaust features inline-exhaust valve to control exhaust pressure for increased performance. Oil jets located beneath the pistons for extra friction reduction and cooling. Idle-Air Control Valve (IACV) minimizes torque reaction and smoothes response to small throttle changes through gradual reductions of air and fuel intake. Smooth-shifting close-ratio six-speed transmission with ratios closely matched to the engine's powerband. Nutless connecting rods contribute to reduced weight and quicker acceleration. Lightweight, forged-aluminum pistons incorporate special shot peening for added strength. Iridium-tip spark plugs improve fuel combustion and performance. Double-pivot tensioner for cam-chain durability. Direct shim-under-bucket valve actuation ensures high-rpm performance and durability with 16,000-mile maintenance intervals. Cylinder head features angled valve insets to improve airflow. Nose-mounted, two-stage ram-air system provides high volume of cool air to the airbox for linear power delivery and incredible engine performance. Liquid-cooled DOHC 16-valve 599 cc four-stroke inline four-cylinder engine features oversquare bore and stroke of 67 mm x 42.5 mm. CBR® Racing Cycle Cover (indoors). MotoGP-derived Honda Electronic Steering Damper (HESD). Dual Stage Fuel Injection System (PGM-DSFI) features two injectors per cylinder. Line-beam headlights feature three-piece multi -reflector design. Centrally located fuel tank increases mass centralization for a more compact frame design. High-revving engine redlines at 15,000 rpm. 41 mm Honda Multi-Action System (HMAS) inverted front fork. Exclusive, MotoGP-derived Unit Pro-Link® Rear Suspension.